Do you want more referrals? Do you want to make getting referrals easier and more systematic? For consultants in particular, referrals are critical to filling your sales pipeline. In larger sales, where who you are is just as important as the services you sell, you’ll need a good word from your clients to their contacts to get referrals. This means continually following up with your clients — and most importantly, asking for referrals. If you don’t ask, you won’t get any. Ask for referrals frequently, and make them part of the deal. When you do great work for your clients that improve their condition, you’ve developed a strong relationship with them. They will want to refer clients to you because this feels good for them. It feels good to be a “connector”. 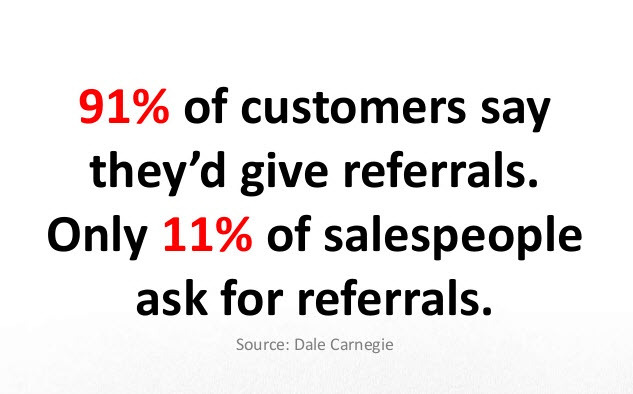 The earlier in your process you start asking for referrals, the faster you’ll start receiving them. Asking for referrals should be a part of your process with each client. You spend your working hours helping improve their condition and solving their problems – the more referrals they can send you, the less time you have to spend marketing, and the more time you can spend delivering excellent results. Don’t know how to ask for referrals? Here’s a script you can use taken from Alan Weiss’ Million Dollar Consulting. “Referrals are the coinage of my realm. We’ve both been pleased with the results this project has generated, and I wonder if you’d be kind enough to give me three or four names of colleagues or contacts whom you believe could benefit from similar value. Referrals aren’t the perfect way of acquiring new leads (there is no perfect method). Every method has its drawbacks. Referrals can be unreliable and passive. You are relying on previous clients to give you names of colleagues who you may be able to help. That being said, they are still one of the best ways for consultants to acquire new leads. This article will teach you how to use a page on your website to get more referrals. I call this the “referral page,” and you can use it as a part of your referral system. There are a few different ways you can use this page. The goal is to onboard referred clients into your sales pipeline with copy compelling them to take action. Unlike most of your pages, this page doesn’t go in your website’s menu. It’s a “secret” page – meaning readers can only visit it when given a link to it by you or a client of yours. The goal of your referral page is to entice referrals to take the relationship a step further. Depending on your business, this could be many different things. You already have these call to actions throughout your website. The critical difference between those pages (your contact page, for example) is that your referral page offers a stronger incentive to the referral towards taking action. After all, referrals are the most qualified leads you can get. These are the best type of leads. They are coming directly from your network from people who like you, trust you, and know your work. When a previous client sends you a referral, they are providing your business what it needs to survive (quality leads). You should treat referrals with special care. This is what your referral page is for. Referrals are important to our businesses and our livelihood as consultants, so offer incentives that the referral can’t miss. Value, value, value. Referrals are special, and you want to treat them as such on this page. These persuasive pieces of your page will make the referral feel more comfortable and increase their chance of taking action. As a consultant, getting referrals from your clients should be a systematic process that starts from your first meeting. It should be a crucial part of your relationship. When you provide great work for your clients they will want to give you referrals. But you still must take a direct, systematic approach to make getting referrals a part of your relationship with each client. Some of your referrals will be introduced to you in person. Some will give you a call. And some will visit your referral page. Since you are asking for referrals throughout every step of your engagements, create different points of contact to increase the amount of referrals that you get. If you have a lead qualification form or offer a free bonus for referrals, you can send a link to your referral page to a referral yourself. If they would rather call you or meet in person, that works too. But make it clear that you offer a referral-only bonus on this page. Whether referrals turn into clients or not, you want to position yourself as a trusted advisor to them from the beginning. You already have the upper hand on other providers with referrals. You want to continue to tip the scale in your favor using this page. Your referral page also comes in handy with your email list. You can send it out to your general list, or a segmented, special list consisting of only previous clients. At the end of certain emails to your list, you can put a link to your referral page. You can tell your list that you are currently accepting new projects. Ask them if anyone on your list knows anyone that may be in need of your services. Include a link to your referral page for them to send to these referrals. This technique brings more scalability to your referral process. Generating referrals at scale will help you save time on getting more clients via referral. DO: Make this page feel less “corporate”. You and your designer should work together to make sure that this page is approachable and friendly. It is aimed at referrals, meaning you want to give them a more personal experience. This means using pictures of you, writing as if you would to a longtime friend, and using a more casual, friendly tone in your copy. This advice is particularly relevant to consulting firms — it’s great for your website to look professional and corporate, but on this page, your designer should turn the dial up on “approachable” and “friendly”. Take the time to do this page right — it will pay off handsomely if you do. This page is used to direct the referral towards taking action. This action is most effective if it leads to starting a relationship. Don’t use this page to offer sales or even your general opt-in bonus. I’ve disabled my own opt-in bonus on my own referral page to keep the referral focused on filling out my project inquiry form. Visitors to this page are referrals. They are the most qualified lead you can get. They are special, so your page should be designed specifically for them. Use it to start a relationship, not make a sale. The sales will come if you use this page. Create your referral page using this article as a guideline. Start sending it to your clients to make it easy for them to refer you using this link. And remember — you should be rewarding your clients who give you referrals. Whenever they refer you to someone, give them a call or shoot them an email to let them know you appreciate their support. Let them know you will take care of their friend, and keep them in the loop on how the project is going. Once you are done your referral page, share it in the comments below. I would love to see what you have done with yours!